Asian food is always a tasty choice for party food. Usually when people think of Asian food, visions of chopsticks come to mind. While eating dinner with chopsticks is fun and makes a great icebreaker at a dinner party or cocktail party, using these utensils often becomes more of a challenge than it's worth. The following recipes produce great finger food dishes that your guests can simply pick up and enjoy. Every cuisine has a version of the dumpling from the Italian ravioli to my personal favorite the Tibetan Mo Mo. 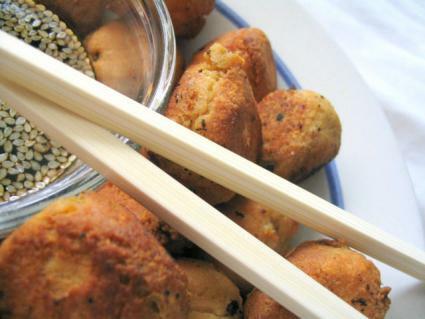 Mo Mo are traditionally steamed and as such make a poor choice as a finger food. However, fried wontons are crisp and make a fabulous finger food for your friends. If you have the time you can make your own wonton skins. For the rest of us, wonton skins are available at most supermarkets and are an excellent option. Blanch the watercress (get a pot of salted water boiling, drop the watercress in for about 30 seconds, remove and immediately place the watercress into a bowl of ice water. We do this to remove the bitterness, give it a bright color and to season it a bit). Mix all the ingredients except the veggie oil in a bowl. Take a wonton wrapper and place a teaspoonful of the filling in the center of the wrapper. Moisten the edges of the wrapper and bring one corner up to meet the corner opposite of it making the square look like a triangle. Yu can leave the wonton like this of crimp the corners. Heat the veggie oil to 360 degrees Fahrenheit. Fry them up and keep them warm in your oven, set the oven to 200- 250 degrees Fahrenheit. Egg rolls are always a popular oriental party food, and you can get the egg roll wrappers at the same time you are getting the wonton wrappers. Heat two tablespoons of veggie oil in a large pan. Using high heat fry the pork until it looses it pink color. Add the chicken and continue to cook until it looses it pink color. Add the shrimp and cook for one more minute. Put the meat mixture in a bowl and add 2 more tablespoons of oil to the pan. Add the mushrooms, sprouts, bamboo shoots and cook for a couple of minutes. Add the chicken broth, rice wine, sugar, salt, and soy sauce. Add the meat mixture to the veggies. Add the scallions and sesame oil. Place an egg roll wrapper in front of you with a corner facing you. Place about 2 tablespoons of mixture in the center of the wrapper. Bring the corner closest to you up to cover the filling. Paint the exposed edges of the wrapper with the egg. Fold the side corners over to the center. Roll up the wrapper to seal it. Once you have rolled all your egg rolls, heat the 4 cups of veggie oil to 360 degrees Fahrenheit. Fry the egg rolls a couple at a time. This sauce makes a tasty companion for the wontons and the egg rolls. Simply stir all the ingredients together in a bowl, and serve individual portions in small dip cups. This sauce also goes well with either recipe, and it's always nice to offer your guests choices. Put all three ingredients in a blender or food processor and puree them. Store the sauce in the refrigerator until it's time to serve your guests. Fresh, delicious and homemade, you can be proud of your oriental dishes and the sauces you created yourself. Give these recipes a practice run before you try serving them at your next get together. That way you'll be sure they will turn out to be a success.